Join over 750 professionals from 500 companies in the Madison area. April 18, 2019 - Meet, Greet & Eat - Lunch with Friends! Facilitated, informal, peer-led discussions at 3 locations each month. Meet, Greet & Eat with your fellow GMA SHRM Members. 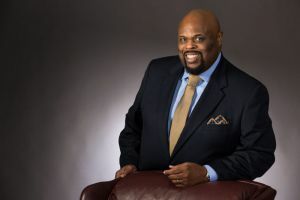 For 2019, GMA SHRM is proud to bring to our members and guests a once in a lifetime opportunity for a full morning keynote and workshop with Dr. Rick Rigsby! When audiences hear Rick Rigsby . . . they are never the same. "Bringing a speaker like Dr. Rick Rigsby to our conference continues our tradition of bringing national caliber speakers to our Madison HR and business community. To be able to spend a full morning with Dr. Rigsby takes our conference to another level and is going to be amazing!" says Director of Human Capital Conference Dana Denny. and the latest HR Legal Updates! The Society for Human Resource Management (SHRM) recently awarded Greater Madison Area SHRM its prestigious EXCEL Award for the Chapter's accomplishments in 2017. The EXCEL Award can be earned at four levels: bronze, silver, gold and platinum. Each level has a prescribed set of requirements and accomplishments that must be met. Greater Madison Area SHRM will receive recognition in SHRM publications and at conferences, a logo to display on its website, and information to share with its members about the significance of this award. The New GMA SHRM Compensation Survey is Now Available! 64 Participating Companies From Dane County with 174 exempt and non-exempt jobs included. Local compensation data is hard to find and the GMA SHRM Compensation survey is a great resource! Losing a key employee over compensation can be expensive (recruiting costs, training a new employee, etc.) and so can over paying employees. 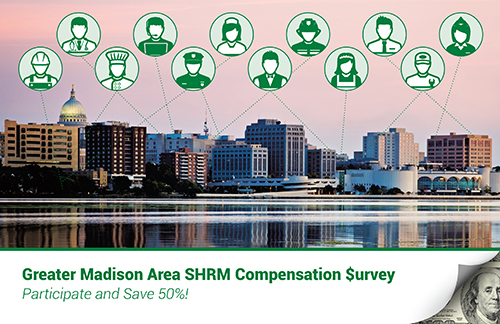 The new GMA SHRM Compensation Survey Report will provide local compensation data related to Base Pay, Total Cash Compensation, as well as Salary Range Information. It will also include information regarding Pay Practices of participating organizations. Click here for more information and to preview the participants and jobs list. GMA SHRM provides a discounted membership to students enrolled in full-time (minimum of 5 credits) HR programs at an undergraduate or 2-year community or technical college. The Idea Exchange is a members only forum to collaborate and share ideas, best practices and general HR knowledge. Below is a live stream of the most request questions asked – click on a question to login, view any responses or respond to the question. How common are Relocation Benefits in the Madison area?